Thank you for your interest in working with Lantern Theater Company. Located in the heart of Center City Philadelphia, the Lantern is committed to an authentic and intimate exploration of the human spirit in our choice of classic, modern, and original works for the stage. During our 25th anniversary season in 2018/19, we will reach a loyal and growing annual audience of over 36,000 through three award-winning core programs: our productions, our audience enrichment series, and our education programs. We are currently seeking qualified candidates for the positions listed below. Our apprentice program provides training in all aspects of nonprofit professional theater management and operations, with rotations in both artistic and administrative functions, including but not limited to box office, house management, development, marketing, stage management, and production. Although not a dedicated acting apprentice program, theater artists on acting tracks are encouraged to apply; where appropriate to the casting, apprentices may have understudy opportunities. Ideal candidates will have recently graduated from an undergraduate theater program and/or have some relevant administrative, technical, and/or artistic theater experience. The program offers a salary of $400 per week and paid time off, as well as free theater tickets, participation in special theater events, and complimentary enrollment in Lantern Theater School classes. Apprentices work full-time schedules (40+ hours per week) and must be available for evening and weekend performances for some of the rotations during the season (September 1, 2019 through June 30, 2020). Our goal is to select three or four apprentices by June 1 to start in August 2019. Candidates without existing conflicts will be given preference. Please send resume and cover letter describing your career objectives to jobs@lanterntheater.org with "2019/20 Season Apprentice" in the subject line. Your cover letter should be no more than one page. Feel free to include separate resumes for your performance experience and other professional experience. Ideally, your cover letter and resumes will be combined into one single PDF. No phone calls, please. We will accept applications through April 30, 2019. Lantern Theater Company highly values diversity in the workplace and is an equal opportunity employer. Qualified candidates of all backgrounds are strongly encouraged to apply. 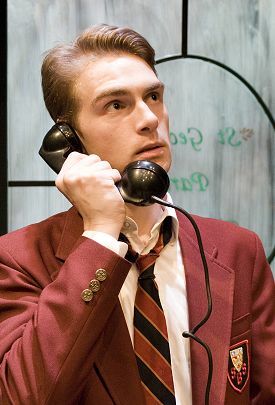 Pictured: Ahren Potratz in "Master Harold"... and the boys (2006, Barrymore Award nomination for Outstanding Overall Production of a Play). Photo: Jeffrey Stockbridge.